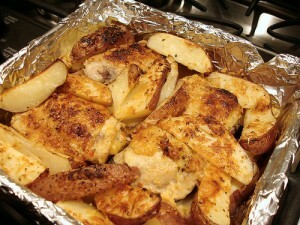 Chicken And Potatoes Roast recipe by Faryal at DesiRecipes.com. Cut the Chicken in big pieces and make small cuts with knife . Pee l& cut potatoes in two pieces. Cut green chilli and make a smooth paste of it and mix in ginger & garlic paste, add salt & red chillies and yellow food colour. Rub this paste on chicken & potatoes pieces. Put the pieces of chicken and potatoes in deep oven dish and cover it with foil and cook in fairly hot oven(220c or gas mark 7)for about 40 minutes . Take out the dish from oven and remove foil and put the dish in oven again .Cook for about 30 mintes or till pieces get brown.